Most hospitals in North America depend on wet-mopping to clean their floors. This may include using a two-bucket system, in which one bucket is filled with cleaning solution and the other with rinse water, or a more common, one-bucket process, in which the bucket is used to store cleaning solution, with the mop wrung out and then dipped in the cleaning solution over and over again. However, hospitals have long been concerned that this type of floor cleaning procedure may actually be spreading contamination throughout the hospital. Are floors in hospitals and other types of facilities still being cleaned with mops and buckets? The answer, of course, is yes. The most common method used today to clean floors is by using mops and buckets. While different techniques and alternatives are now available that were not in use in the 1970s, those alternatives are just now making inroads into floor cleaning. Some might also ask how contaminated floors could spread infections. The answer here is something called cross-contamination. It is estimated we have as many as 50 direct and indirect contacts with floor surfaces every day. If the floor is contaminated, we can then spread this contamination onto other surfaces or, if we touch our eyes, nose, or mouth, ingest the contaminants, potentially causing infection. • The buckets used were cleaned and disinfected with a hospital-grade disinfectant. The disinfectant was mixed with one gallon of water. • Samples were then taken from the mops and the mop water and tested using Petri dishes. All cultures were allowed to incubate for 24 hours. In a second experiment, the researchers used twelve 24-ounce mop heads. They were again extracted and washed as above, but this time they were sent to the hospital laundry for further washing. • That powerful hospital-grade disinfectants be used in the cleaning solution to help slow the growth of contamination. • That buckets be cleaned and rinsed every 60 minutes. • That mops be rinsed and allowed to air dry and buckets be emptied and cleaned whenever housekeepers took breaks. What they did find was that mops incubated bacteria such as Alcaligenes, Enterobacter, E. coli, and Streptococcus. Further, over a three-month period, the most frequent single infecting organism in the hospital was E. coli. These organisms were also found to survive as long as five weeks on a mop head. While these organisms can cause nosocomial infections, it was not possible to determine if the germs on the mop heads were the source of nosocomial infections in the hospital. This is because these organisms may be found on other hospital surfaces. 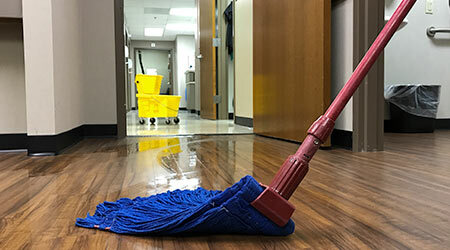 If the scientists in this study concluded that mopping floors is an “unsatisfactory” process, what options do hospital administrators, as well as administrators of schools, office buildings, and a variety of other facilities, have to replace it. In very large floor areas, one option is to use an automatic scrubber. The key benefits are that no mops are used and that fresh water/cleaning solution is always being applied to the floor. As the machine is walked over the floor, moisture and floor soils are vacuumed up. • These machines are costly to select and maintain, so they should only be selected for cleaning very large floor surfaces. 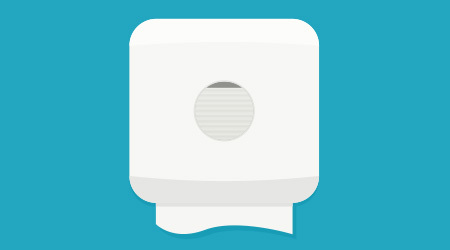 • Cleaning workers should be properly trained on how to use these machines. • The rotary pads (or brushes on a cylindrical scrubber) should be changed frequently. Just like mops, they may become contaminated over time. • Automatic scrubbers often cannot clean floors underneath ledges and furniture and are often hard to maneuver around obstacles. Another option is to use an auto-vac floor cleaning system. With these systems, once again, no mops are used. Fresh cleaning solution is applied to the floor. As the machine is walked over the floor, a pad provides agitation to loosen soils, which are then vacuumed up by the machine. Auto-vac systems work well on small to large floors, are inexpensive, and require minimal training. These machines are easy to maneuver around furniture and obstacles and cleaning workers can attach a wand to the system to clean hard to reach areas. Our goal with this White Paper, is to provide administrators and cleaning professionals with factual data and a rational basis for action, looking for floor cleaning alternatives that help reduce the spread of contaminants and keep facilities healthier. As we mentioned earlier, while the discussion here involved medical facilities, the same concerns about the spread of disease can apply to schools, office buildings, senior care centers, and other types of facilities. Mops and buckets are simply not an effective way to keep floors and facilities healthy. * John C. N. Westwood, Mary A. Mitchell, and Suzanne Legace, “Hospital Sanitation: The Massive Bacterial Contamination of the Wet Mop,” Applied Microbiology 21, no. 4 (April 1971), 693–697; https://www.ncbi.nlm.nih.gov/pmc/articles/PMC377258/pdf/applmicro00114-0129.pdf. ** Abhishek Deshpandi et al., “Are Hospital Floors An Underappreciated Reservoir For Transmission Of Healthcare-Associated Pathogens?” American Journal of Infection Control 45, no. 3 (March 1, 2017), 336–338; https://doi.org/10.1016/j.ajic.2016.11.005.